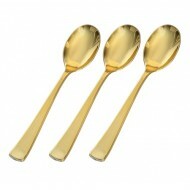 Whether you want to improve the appearance of your dinner table or impress your guests, you can always choose our exotic, elegant, and decorative range of gold plastic cutlery. 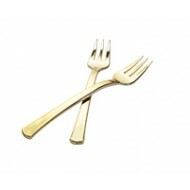 Our cutlery is available in various styles. They are perfect for weddings, catered events, and more. 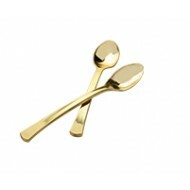 The best part about our cutlery is the comfortable handling and convenience they offer. In other words, they are easy to use. Irrespective of the type of occasion, your guests will love to use our smart and elegant cutlery, and appreciate it as well. 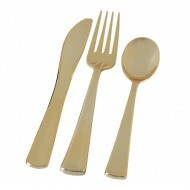 Besides that our cutlery is affordable and available in a wide range to suite your specific taste, lifestyle and preferences. 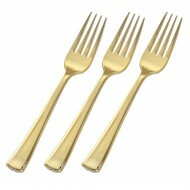 Our gold plastic cutlery can transform any occasion. 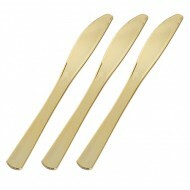 Made of heavyweight polystyrene plastic Glossy gold finish Elegant handle Same great ..
Made of heavy weight polystyrene plastic Glossy gold finish Elegant handle Same great look ..
Gold Heavyweight Plastic Knives (24pk) ..
Gold Heavyweight Plastic Combo Cutlery Set (24pk) ..
Gold Mini Plastic Forks (24pk) ..
Gold Mini Plastic Spoons (24pk) ..